Temple News Agency in La Porte now is owned and operated by J.D. and Jennifer Flynn. The Temple News Agency will mark its 100th anniversary this year. The Flynns said they were patrons of the café and eatery at 816 Jefferson Ave. before taking over the business in September. 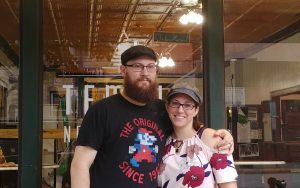 The Flynns hope to host more events, including game and open mic nights, as well as work on some renovations and remodeling and expand the lunch menu. “Buying Temple and continuing the legacy is like being able to carry the torch of all the owners before us who have put a bit of themselves into Temple,” J.D. Flynn said.